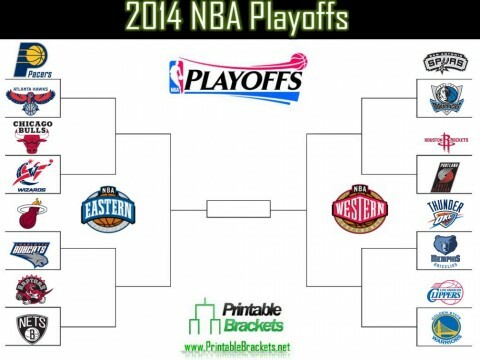 The marathon NBA regular season is over and it’s time for round one of the playoffs beginning Saturday April 19th. I will give my prediction and breakdown of each of the eight series in round one. Atlanta is the only team of sixteen in the playoffs with a losing record (38-44), while Indiana held off Miami down the stretch run for home court throughout the playoffs, but struggled to remain cohesive in the second half of the season. Indiana boasts the strongest home record in the league this season with a 35-6 mark at Bankers Life Fieldhouse. Although Atlanta managed to split the four game regular season series and grab one win in Indiana, I don’t believe they will be a threat to Indiana. Pacers in 5. Miami has won fifteen consecutive games against the Bobcats. This is clearly not the ideal match for Charlotte who finished just one game behind both Brooklyn and Washington for the sixth and fifth seeds respectively. The last time these two teams met LeBron James scored 61 points with 7 rebounds and 5 assists as the Heat cruised to a 124-107 win. The defending world champions should have little difficulty keeping their streak of dominance against Charlotte going. Heat in 4. The Raptors, led by DeMar DeRozan (22.7 ppg, 4 apg, 4.3 rpg), stormed the Atlantic division and upset the more hyped New York Knicks and Brooklyn Nets. Through a combination of youth and gutsy trades (moving on from Andrea Bargnani and Rudy Gay), the Raptors found an addition by subtraction method that propelled them to their best season in years. Toronto was second only to Miami in points per game in the East, averaging 101.3. Brooklyn is the polar opposite with a team built with win-now vets like Kevin Garnett, Paul Pierce, Deron Williams and Joe Johnson at the core. In this clash of styles it will be Brooklyn finding themselves more comfortable with the normal playoff pace of half court, lower scoring, defensive battles. I favor the club with the experience over the youth. Nets in 6. This is another clash of offense vs. defense. John Wall and Bradley Beal lead Washington as one of the best young backcourts in the league. Chicago is the lowest scoring team in the NBA at 93.7 ppg and they allow the lowest scoring against at just 91.8 ppg. The front court of Carlos Boozer and Joakim Noah will protect the rim and the Bulls will find enough offense to take an entertaining series. Bulls in 6. Tony Parker, Manu Ginobili and Tim Duncan. This never gets old. The Spurs are again the best in the West and this Texas sized first round matchup features other oldies but goodies on the Dallas side as Dirk Nowitzki (15th year), Vince Carter (15th year) and Shawn Marion (14th year) lead the Mavericks. After the stunning NBA Finals loss in Miami last year it seems San Antonio is on a mission to get back and with Danny Green and Kawhi Leonard they have done a better job supplementing their old guys than Dallas has. San Antonio won the regular season series 4-0. Spurs in 5. These two teams have a way of finding one another in the playoffs. In 2010 the Thunder survived the pesky Grizzlies in a hard fought seven game series, they met again last season and Memphis pounded the Thunder who were outgunned without star guard Russell Westbrook. Memphis has a good recipe for postseason success with good on-ball defenders and tough post players to cover in Marc Gasol and Zach Randolph. Oklahoma City will throw Kendrick Perkins, Serge Ibaka and Nick Collison at Memphis’ bigs and hope to keep them in check. With a healthy Westbrook and MVP candidate Kevin Durant and the best home court in the West (34-7) there are plenty of reasons to believe OKC wins the playoff tiebreaker in the third meeting of these cities. Thunder in 6. Chris Paul, Blake Griffin and DeAndre Jordan make L.A. one of the most entertaining and feared teams in the NBA. The Warriors led by Stephen Curry and Klay Thompson will also light up the scoreboards and this is the series that should be the most exciting and high scoring of the opening round. The regular season series was split 2-2 and this should be evenly matched. I leaned towards Golden State until word broke that Andrew Bogut (7.3 ppg, 10 rpg, 1.8 bpg) is out indefinitely with a broken rib. Without their big man to protect the rim I favor the Clips to survive and advance. Clippers in 7. Another great series that promises points. Houston was 2nd in the NBA in scoring at 107.7 ppg led by James Harden (25.4 ppg) and Dwight Howard (18.3 ppg) they can score inside and out. Chandler Parsons could be the X-factor as the third scoring option for Houston, he shot 47.2% from the field this season and scored 16.6 ppg. Portland was 4th in the league in points per game at 106.7. Damian Lillard and LaMarcus Aldridge give them a potent inside-outside scoring punch similar to Houston. This is a razor close series where I favor home court. Houston was an outstanding 33-8 at the Toyota Center and that will be the difference. Rockets in 7. Tom Lembo is a 2005 graduate of Mount Saint Mary College in Newburgh, NY. He served as host of the first sports talk radio show in MSMC history "The Lembo and Guido Show featuring Bronx Tale Eddie" and later "The Lembo and Brooklyn Show", also the first sports television program "Three Point Stand". Served as a part-time public address announcer for the MSMC Blue Knights Men's basketball team and the Hudson Valley Renegades minor league baseball team (short season single A - Tampa Bay Rays affiliate). His first love is the Dallas Cowboys followed closely in any order by an excellent boxing match (Sergio Martinez and Roy Jones Jr. are all-time favorites), New York Knicks and New York Mets.